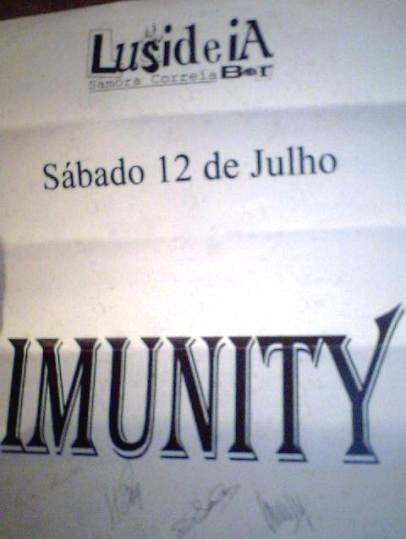 Imunity were formed in the beginning of 1992 in Vila Franca de Xira. Project formed by Claudio Santos vocals/ guitar, under the name Dark Fate. In the end of the Summer, Nuno Manuel guitar joins and both begin to work on songs already composed by Claudio. Meantime, without a bassist and a drummer, shortly after the name was changed to Imunity. In November ´92, a drummer, Miguel Pontes (aka Mick Thor, who also designed the logo) joins in, and it was when the band started rehearsing more seriously in a rented studio, more precisely at Jap Studios, located in Sacavem. But soon they realize that they could not proceed due to the drummer difficulties, they split with Miguel. Meanwhile, Nuno “Kazuza” Mariano (Mortalha) comes to Imunity as a bass player. 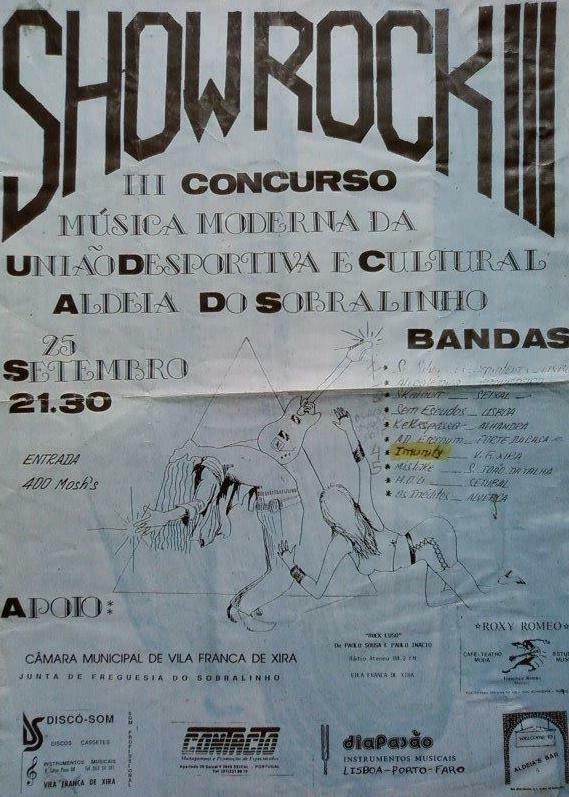 Shortly thereafter, in May 1992, the band "recruits" Helder Rodrigues, Mortalha's drummer from Arruda dos Vinhos. Which gave a fast development in the songs. Althought, it would not be possible, without the new and definitive rehearsing place, located in Cachoeiras. Facilitated by a friend of the band Hugo, who would eventually appear as a guest on 2 songs, playing keys. 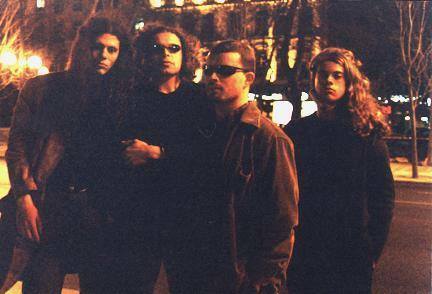 Imunity started at 100% in April 18th 1993, “Sea Of Tears” was the first full track completed. 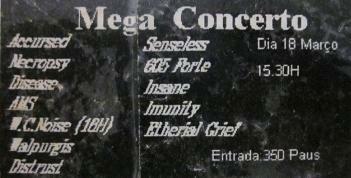 Around May 1993, the group begins recording what would be Imunity´s first promo tape. An intro, “Rise to Infinity”, “Sea Of Tears” and “Heaven Defie”, was recorded at the rehearsal place, during a Sunday day, through a system with a microphone. However, it was never released with cover art, just dubbed to friends and anyone who asked, also sent to radio shows and fanzines in order to promote the band. October 9th, at the CPD pavilion, Benavente, they play live for the 2nd time, with Deceiver, Filii Nigrantium Infernalium and Shrine. At this point several songs were part of the band´s repertoire, “Eternal Sleep”, “Unholy Truth”, “Rise to Infinity” and “Last Remembrance” (instrumental). 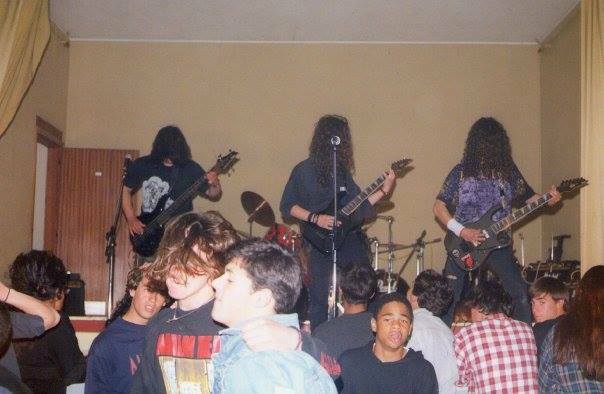 The band continues to rehearse regularly, composing new songs and playing their 3rd gig, again at the UDCAS pavilion (Sobralinho) the Day at The Morgue festival, along with Paranormal Waltz, Exomortis, Exiled, Decayed, Sarcastic Angel and Dementia Pre-Cox, March 12th 1994. 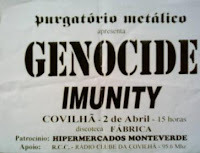 Three weeks later, April 2nd, they arrive at the north of the country in Covilhã, opening for Genocide at the Fábrica (Factory) discotheque. Alverca, April 16th at the hall of the Firefighters, with Cannabis. For the first time a concert was scheduled in their home town but due to bad weather conditions, they did not play (April 23th 1994). 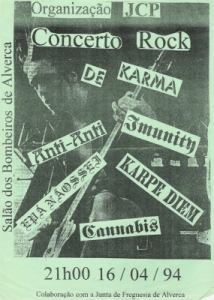 May 28th Vala do Carregado (Castanheira do Ribatejo), with Mistake, 605 Forte and Nameless. June 10th outdoor at the CSRDO in Ota, with Afterdeath among other bands. June 15th outdoor gig in Alverca with Miss Kiss. June 26th in Alhos Vedros, with the band that would have a major international status Moonspell, and Grog. 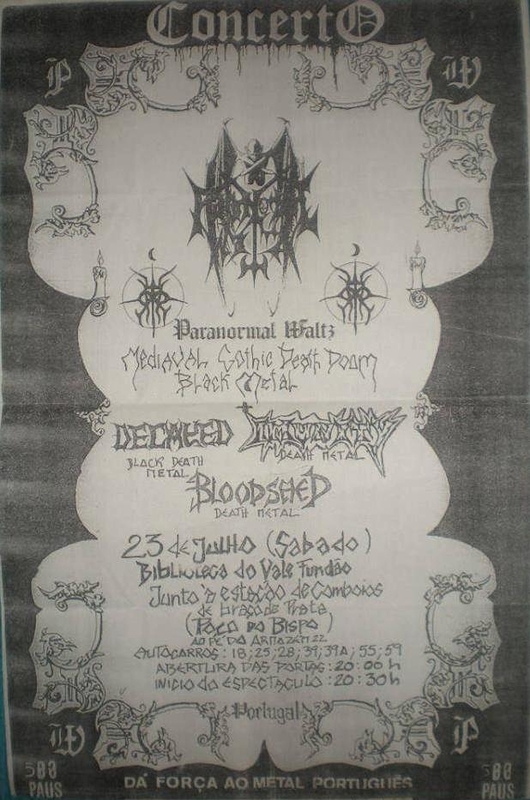 Concert bill: Paranormal Waltz, Decayed and Bloodshed, July 23th 1994, Poço de Bispo, Lisbon, Imunity cancel their performance. Due to lack of conditions. Still, some bands play. With more rehearsing and some concerts, Imunity begin to want to go a little further. This desire is materialized with the recording of the promo-track titled "Unholy Truth". Recorded at Studio Gar (Queluz), November 27th 1994. Produced by Jorge Imperial and co-produced by the band. "Ember", "Birth in Sorrow", "Brutal Morbid Desease" were songs added to their list. Nuno Mariano suffers an accident, injuring one hand, preventing him from playing. Jané (Horácio) begins rehearsing with the band and replaces Nuno at a concert at Bar Ben, Alcobaça. Jané plays just a few songs, not the entire gig. 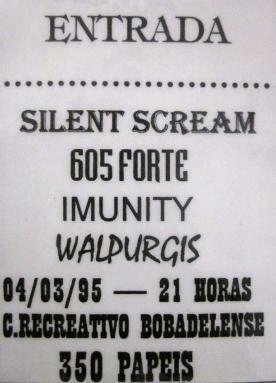 The band does two more concerts in March 1995, first at the Clube Recreativo Bobadelense on day 4th (w/ Silent Scream, 605 Forte, Walpurgis) and at a circus tend in São João da Talha on day 18th (w/ W.C.Noise, Etherial Grief, Necropsy, and several others) and appears in some local fanzines and national radios. 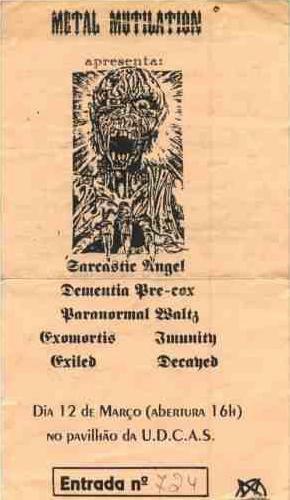 But lacked Imunity to rid themselves of certain clichés that cataloged the band as being one more Death Metal product. At this point, in the summer of 1995, Cláudio Santos vocals/ guitar leaves the band for disagreeing with the way the remaining elements were willing to follow. Imunity began to embark on more ambitious terrain. To the place left vacant by Claudio arrives Rui Vieira (from Mortalha) who takes first on guitar and later the voice. Imunity are constituted this time by Rui Vieira vocals/ guitar, Helder Rodrigues drums, Nuno Manuel guitar and Nuno Mariano bass. With this formation the band rehearses new material and when prepared to enter the studio, Nuno Mariano leaves the band. Even in these conditions, Imunity go on recording. The venue was Cais 14 in Alhandra where it is recorded "Easter Rumour" and "Oversea (Territory War)", two promotional songs, exclusively for radio, fanzines and other media. Imunity give another series of concerts and promote their work all over the country through the radio and fanzines. 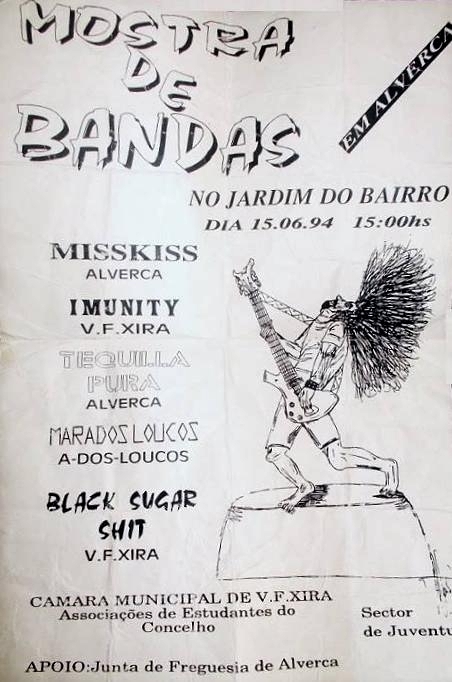 Fisrt gig with Rui was at the Lusideia Bar, Samora Correia, July 12th 1997. At the same time, the band prepares itself again to go into the studio and record the one that was actually the first demo of Imunity. Still not having a bassist, the band enters the studio JAP Studios in Sacavem, and records at the end of 1998 "Liberty" with six tracks. "The Revolutionary Red Cover," "Still Liberty ...", "P.O.I. (Product Off Imagination)", "Seeding The Lie", "... Still War" and "a Dream Called Liberty" are the titles of the six songs in this demo tape. "Liberty" shows a more mature and original band, willing to go a little further. 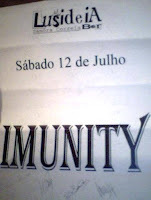 With the inclusion of Portuguese traditional sounds (cavaquinho, adufe or bombo), sometimes with faster, sometimes with slower parts, Imunity had in "Liberty" the best work of its career. Besides music and energy that Imunity transmits, they combine all this with an excellent artwork which includes the model that appears on the cover of "Liberty". Meanwhile, Énio Lança (bass) enters the band and at the end of the recordings of "Liberty", Nuno Manuel leaves. To his replacement comes Bruno Henriques. The year 1998 is the year of all challenges for Imunity and, incredibly, the band is invited to make a soundtrack for a program of the private television channel SIC. "The Resistant", which went on air in September of the same year, is the name of a real story for which Imunity did a soundtrack. Consisting of an instrumental part with truly mysterious moments and suspense, the band also records a version of José "Zeca" Afonso's "Grândola Vila Morena", the song that was the signal for the beginning of the 1974 Portuguese revolution. The band suffers some more changes with the left of Énio Lança replaced by Nuno Mariano, the original bassist. 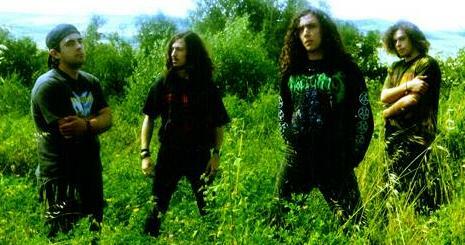 By this time, the band members decide to change the name of the band because the sound had no more links with the Imunity name, strongly linked to its Death Metal origins. The chosen name would be Groundustry, an attempt to gain a new life. Some of the new songs written by this time were "Essence", "Rewine", "Promise/Believe/Betray", "Moneytrees", "Rhythmotion" or "Give Ideas To GOD". 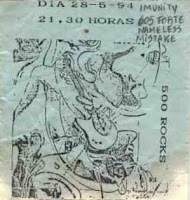 The band still played live some shows but the lack of time, incompatibilities, constant lineup changes and some saturation dictated the end of Imunity / Groundustry.